United Communicators Celebrates 28 Years! Home / anniversaries / United Communicators Celebrates 28 Years! 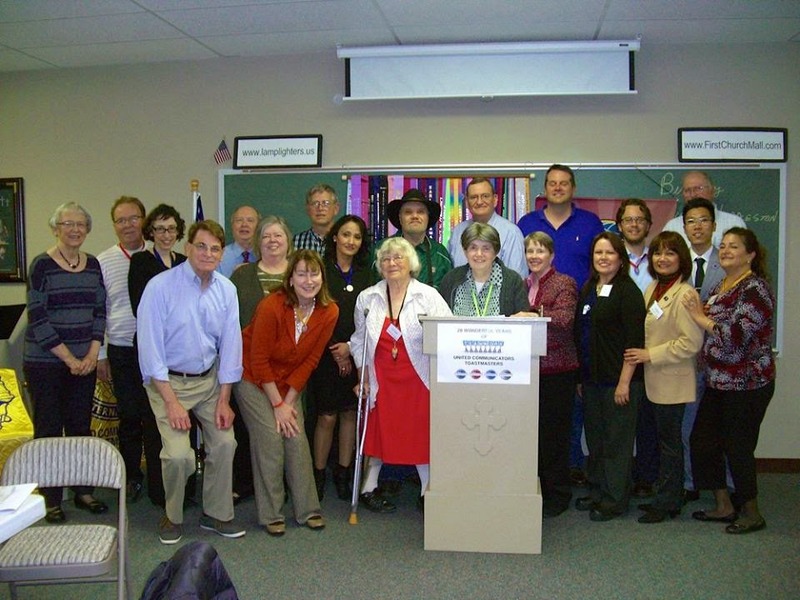 United Communicators Toastmasters in Arlington celebrated its 28th Anniversary on Tuesday, April 28th. The theme was “It Takes a Team” which is also the District 25 theme for 2014-2015. The decorations recognized local sports teams with special emphasis on the Texas Rangers who have played in Arlington since 1972.
in front of the clubs historical and new banners! 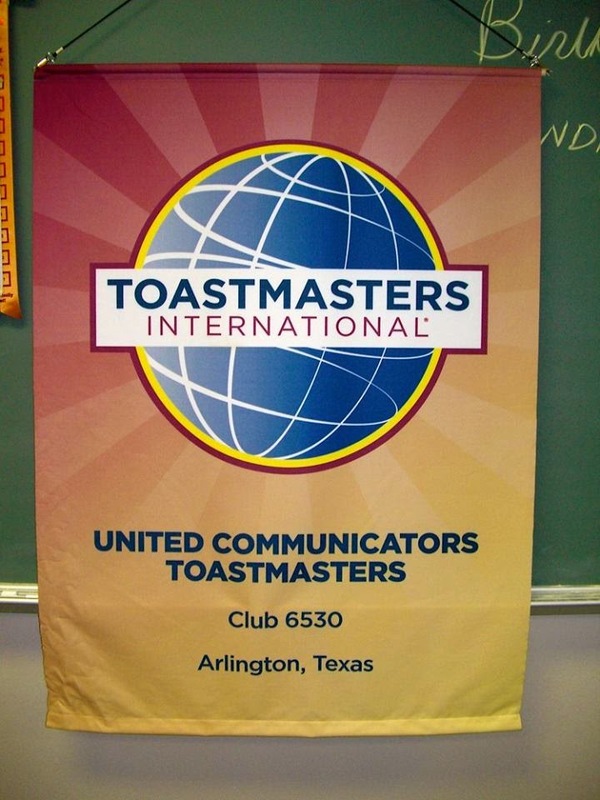 Club 6530 was chartered in April 1987 as United Singles Toastmasters. In January 2005, the club became an open club and adopted its current name. Total attendance for the meeting was 34, including four former members. 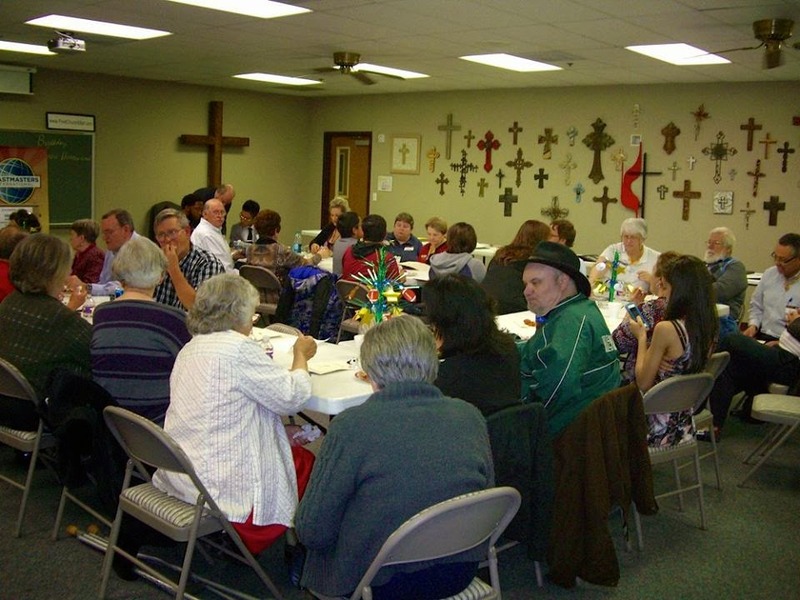 Sixteen current members, including Division C Governor Sonia Leza and Area 66 Governor Curtis Holland, attended. United Communicators has a full house! For the first time ever, the top three leaders of District 25 were present for an anniversary celebration. Thanks to District Governor Marylee Mims, Lieutenant Governor Education and Training Cindy Hinckley, and Lieutenant Governor Marketing Jodie Sanders for your support. Also attending were Area 31 Governor Walter Thomas, Area 44 Governor Terry Mencke, and Chuck Mencke. Xi He, who just completed his Competent Communicator award, did an excellent job as Toastmaster. Sonia Leza recognized the ten Presidents of the club who were in attendance. 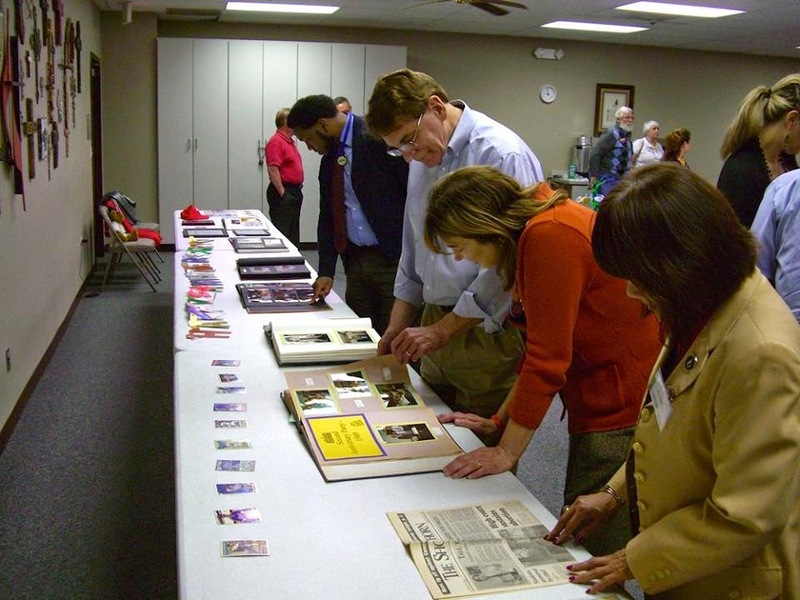 Club Historian Harry Schneider distributed retrospective 28th Anniversary booklets to those in attendance. Thanks to Harry’s wife Judy for all her help with the project. The booklet was dedicated to George Brandsma, a charter member of the club. George just turned 92 and was still active in United Communicators at 85. 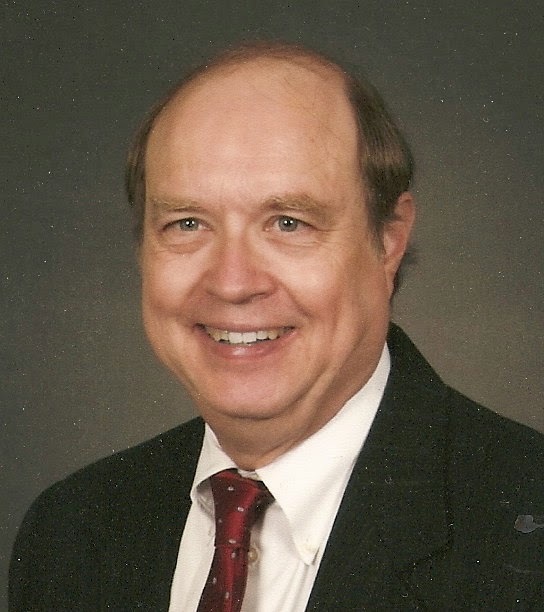 He served thirteen terms as club treasurer. The booklet was in memory of Howard Meyers (1951-2001).Howard won the District 25 Tall Tales Contest in 1992. He was the first club member to participate in a District-level contest and the first member to win a District-level contest. Among its achievements, United Communicators members have served District 25 as Secretary, Treasurer, Audit Chair, and Realignment Chair. Fourteen times club members have been named Outstanding Officers for District 25. 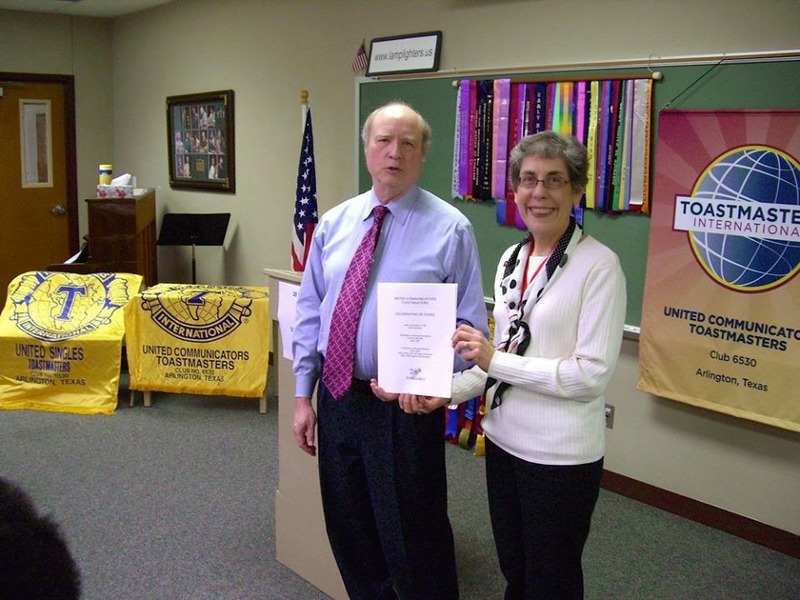 Club members have won District-level contests four times. Previous Post LinkNew District Leader TitlesNext Post LinkThe Contests! The Winners!